Other members of the proposing team: Stefano Salon (OGS), Heloise Lavigne (OGS), to be hired postdoc (OGS), Fabrizio D’Ortenzio (UPMC-LOV), Vincent Taillandier (UPMC-LOV), to be hired postdoc (UPMC-LOV). 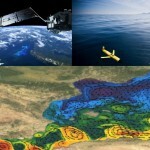 External experts: Christel Pinazo (MIO), Clément Fontana (Geoid-Ocean). 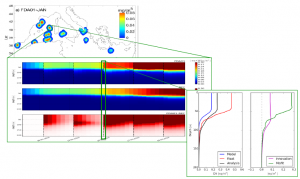 MASSIMILI project aims at developing a multi-data assimilation framework for BGC-Argo float and Satellite observations to be integrated into the CMEMS MED-MFC-Biogeochemistry model system. The assimilation scheme adopted is a variational method (3DVarBio), which is the current assimilation scheme in use in the CMEMS MED-MFC-Biogeochemistry component. Key operators of the 3DVarBio code (i.e. 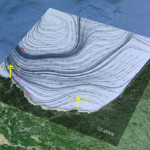 the observation operator, H, the vertical, horizontal and biogeochemical components of the background error covariance, Vv, Vh and Vb respectively, and the observation error covariance, R) have been re-designed and optimized for the assimilation of the BGC-Argo data vertical profiles. BGC-Argo data assimilation has a relevant impact on biogeochemistry by improving the description of the vertical structure. Figure 1. Maps of the vertical integrated innovation of chlorophyll (upper box) and Hovmoeller diagrams of chlorophyll concentration (middle green box) of the assimilation run (upper), the reference run (middle) and their differences (lower) and the timing of the assimilation steps (dashed black vertical lines) are shown. The vertical chlorophyll profiles of the model forecasts (blue), float observations (red), analysis (black), misfits (green) and innovation (purple) for the assimilation step on the 20th of January are also shown in the lower green box. Regarding chlorophyll (Figure I), the novel DA changes the concentration and shapes of profiles during the two most significant seasonal biogeochemical processes (winter surface bloom and summer deep chlorophyll maximum). Further, the observation error (estimated by Triple Collocation method and a-posterior error estimate) plays a major role in controlling the effectiveness of the assimilation. The estimated non-uniform correlation radius length scale, which is of the order of the mesoscale dynamics, together with the actual size of the BGC-Argo floats network, allow to significantly constrain the phytoplankton dynamics up to 10% of the Mediterranean Sea area (Figure I, upper box). We estimated that the frequency of the assimilation step can be optimized in order to enhance the persistence of the innovation and the consistency with the physical field. Regarding nitrate, the impact of the BGC-Argo data assimilation is much larger (in term of spatial scales) given the fact that the corrections change the profiles down to 500 m depth. The multi-platform assimilation (joint assimilation of BGC-Argo float and Satellite chlrophyll) shows that BGC-Argo assimilation has local impacts, which are consistent along the water column, whereas satellite assimilation produces spatially homogeneous corrections (example of the impact of assimilation on Primary Production in Figure II). The most appropriate setup of the joint assimilation would be to assimilate separately satellite and float data (i.e. float assimilated daily and satellite assimilated weekly), and to assign a higher hierarchical rank to the float data over the satellite on a local basis by reducing the error of BGC-Argo float data. Figure 2. Primary production (mgC/m2/y) averaged over 1 week of hindcast simulation (24-31 August 2015, upper panel), and relative anomaly of the analysis run with assimilation of satellite only (middle panel) and with joint assimilation of BGC-Argo and satellite data (lower panel).